The ice bucket challenge is the latest craze to sweep the net, requiring people to simply pour a bucket of ice cold water on themselves to raise awareness for ALS, also known as motor neurone disease or Lou Gherig's disease. 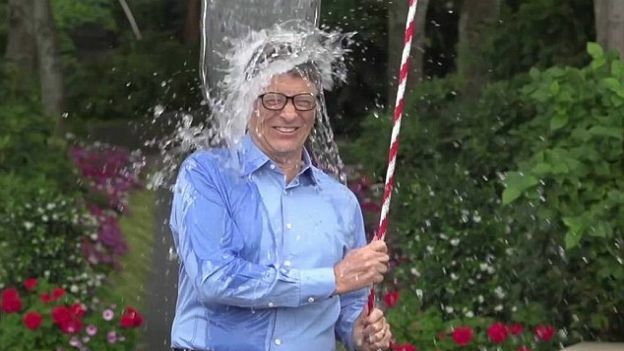 After being challenged by Facebook boss Mark Zuckerberg, Bill Gates decided to take things to the next level and prove just how much of a nerd he really is. The video - posted on his gatesnotes blog - shows Gates watching Zuckerberg nominate him and then rigging up an over-elaborate plan to carry out the simple task. Rather than holding the bucket, Gates hangs the bucket on a series of beams connected to a rope below, which he then pulls to drench himself in the ice water. Challengers are asked to complete the task within 24-hours of being nominated and must chose three other people give it a go. Gates selected Tesla CEO Elon Musk, Ryan Seacrest and Chris Anderson from TED to participate next. Other tech leaders have taken part in the trend, including Microsoft CEO Satya Nadella and Apple CEO Tim Cook. The ASL association says it's seen a $3 million rise in donations compared to last year thanks to the support raised by the challenge.